I can't believe Luke it 1!! I decided I want to go back through the memories of 1 year ago today... so here's a warning: this could(will) be a very long post. 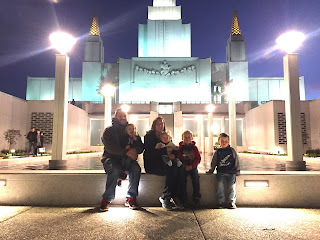 This time last year (this morning when I started this post) I was laying on a birthing ball trying to relax through the contractions and wondering if they were real labor or false labor. My mom suggested we try to go for a walk because if it was real labor the contractions would only get stronger. We went out and got out of our complex and around the corner but when a contraction would hit it didn't do me any good to lean on Tyler, it would take me to my hands and knees. We decided a walk wasn't going to be very productive since I couldn't make it very many feet without get back on my hands and knees... SO we went back to our apartment. I had Tyler push on a spot on my back that we were taught would relieve some of the pressure by causing counter pressure, but after a while it started to hurt because I asked him to push harder and harder and it was starting to bruise. I was getting really distraught because he couldn't really push on my back anymore and I still wasn't sure it wasn't false labor (having never been in labor before). So I called my mom again and told her my frustration and she suggested that we do an effleurage bath to help the labor along. For anyone who doesn't know what an effleurage bath is, Tyler filled the tub about half way with warm water and then as I layed on my back trying to relax, he used a cup to scoop up the water and gently pour it over my baby belly. It only took 5 or 10 minutes (I think... I mean really my sense of time was all sorts of messed up and everything felt faster than it was. I woke up at 3 in the morning and started having contractions and it was 2 or 3 in the afternoon by this time. It didn't feel like it had been 12 hours.) before I couldn't lay there and relax anymore because the contractions were really strong and I felt too restricted in that tiny tub. When I got out the contractions were strong and resonating down in my legs just like my mom said. 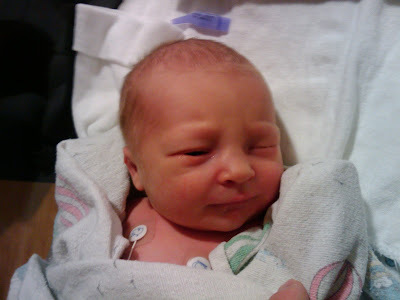 We decided it was finally time to call my midwife and see if we should head to the hospital. As I tried to get ready and Tyler cleaned up and grabbed somethings he decided it was time to give me a pep talk. I was still having a really hard time getting through the contractions and I felt like giving up. He got down and told me I needed to dig deep and figure out how to concentrate through the contractions because although he was happy to push on my back to help... it wasn't really as much of an option because I was bruised and we didn't know what would happen at the hospital and if it would be a situation that would allow him to push on my back. I was a little frustrated at him for a minute because I felt selfish and thought he just didn't want to push on my back anymore (it is very tiring, just ask Tyler who was there for me or my parents or my brother in law who all took turns doing this for my sister). I realized he was right though and that he wasn't just looking for a way out, he was trying to prepare me for what was coming as best he could. I called the midwife and they said it was time to go to the hospital so we headed out. I know it really wasn't safe, but I couldn't bare to sit in the chair so I knelt in front of the passenger side seat and worked through the contractions. When we got inside and up to the maternity floor we went to check in and I dropped to my hands and knees for a strong contraction. Tyler tried to keep checking in but the nurse he was working with was very alarmed when I dropped down to my hands and knees to handle the contraction and had someone go get me a wheelchair. The whisked me away and before I knew it I was in a birthing room, complete with a jetted tub (one thing I was hoping to try). My midwife wasn't on duty that day so one of the other midwives in her clinic that I'd met came to deliver Luke. I was happy it was her and not the other lady I'd met because the other lady wasn't very easy to connect with for me. I just didn't feel very comfortable around the other midwife so if I had to have a replacement midwife, I was glad it was Nancie Mooy. She was very kind and understanding and she really wanted to try to do things the way I wanted. She came in and checked me and I was dilated far enough that they were happy with it, but I really can't remember what I was at the time because I was trying to relax and go inside my head to keep some control over my self. A short while later she checked me again and a moment later my water broke. Can I just say... I am SOOOOOOO glad I was in the birthing room when my water broke. That was a whole heck of a lot of stuff. It was weird though, it felt like a large pressure had been released when my water broke. I asked to sit in the jetted tub so Nancie got it all set up and she and Tyler helped me in. I was really tired by now. 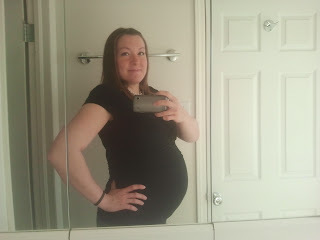 I'd been awake and working through contractions for over 12 hours and as I sat in the tub I was able to relax more. I even dosed off a little. I didn't mean to and I wouldn't say I fell asleep completely, but I had little dreams that Tyler was saying to doing something that he wasn't. It seemed real because the situation in my dream was the same but I can't remember what Tyler was saying in my dream. Suddenly I was awake again and I felt like I needed to use the toilet. I thought that was a pretty inconvenient thing, but I also remembered hearing that some people feel like the need to do that when the baby is moving down. I wasn't sure which it was but when I told me midwife, she sided with the baby and they helped me out of the tub and back to the bed. After they set up the heart monitor and the contraction monitor they started saying something about the baby being posterior and so I remembered back to what I'd been told about that situation: get on your hands and knees and do the yoga stretch the cat and the cow or what ever it's called. I asked if I could get on my hands and knees and my midwife was all impressed and said, something like "well she knows just what to do, doesn't she. Good for you!" So I did that for a while and then I laid back down and they checked out the situation and things looked really good but they had stopped progressing. Things had really been moving along for a while and then they just stopped so she tried to tell what was going on and determined that Luke was still turned a little and so they positioned me on my side in the hopes that he would turn because he couldn't progress turned the way he was, he was stuck. They were worried because Luke seemed to be getting stressed and so they put and oxygen mask on me to help him get enough oxygen. That made it a whole lot harder to keep my breathing under control. I felt like I couldn't breath and my head was really hot so Tyler got a wash cloth wet and put it on my forehead. I had him rinse it with cool water often and he held my hand and my leg and was standing there to do whatever he could. I tried to ask him for something during a contraction and he told me he had to sit down. I couldn't understand why he would need to sit down when I felt like I needed him and I said, "I'm sorry, I need you, you can't sit down right now." He told me after that he felt like he was about to pass out right then. Oops. Sorry husband. I didn't mean to be so selfish. He hadn't really eaten anything all day so he felt like he would pass out from standing and hold me so long with no energy. Luckily we'd brought a lunch box with an apple and some crackers so he took a bite when he could. Anyway I did what I was told and I pushed and pushed and to me things didn't seem different from push to push but everyone was telling me I was doing a great job and that he was crowning and I just needed to do a few more really good pushes like I was doing. Well... Luke was still stuck and every time I pushed his head would get to a certain point and then stop and when I stopped pushing he'd go back a little. They told me they were worried that if I couldn't push him out soon that Luke would go into distress and they would have to do an emergency c-section. She told me that because I hadn't had an epidural, they would have to put me out during the c-section and Tyler wouldn't be allowed in. This really wasn't encouraging and Tyler looked really upset. I think they said it wasn't too late for me to get an epidural just incase they had to do a c-section but I really didn't want one. I was doing really well as far a the pain and pressure went, and that wasn't something I wanted to give in on. I knew I could get Luke out and I asked if they could just give me more time. She said I could have another half and hour or so if Luke's signs didn't get worse. I was determined to do this naturally and so when I heard quite talking of using forceps or the vacuum between my midwife and the nurses, I gritted my teeth and pushed as hard as I could when the next contraction came. My midwife was caught off guard and jumped over to work through the contraction. It seemed like that push had done more than anything for a long while and she was ready to keep trying. I keep pushing as hard as I could and suddenly my midwife gave me an episiotomy without any warning. Tyler had to keep himself from punching her because he said it looked really painful, I felt it a little and made a sound of pain and he knew I hadn't wanted an episiotomy so he was really upset with her for doing it. I guess she thought it was the smallest thing she could do to help things start moving though and it worked. I pushed a short while longer and felt like I was giving it everything I had. I closed my eyes and I prayed because I didn't think I could keep it up a lot longer, I was completely exhauseted! I told my Father in Heaven I was giving it everything I had and I really wanted to get this baby out naturally because it would be best for both of us and I'd worked so hard to do it. I told Him I needed his help and it was in his hands now. Literally 2 pushes later Luke finally made it out. It was 11:09 pm and I'd pushed for around 3 hours I think. They whisked him away to a little station they'd set up in the room because they could see when my water broke that he'd had a bowel movement in the womb so they needed to suction everything out so he could breath and not be poisoned. As they suctioned him out they noticed that he was very stressed and his oxygen levels were low because of it. They told me they needed to take him to the special care nursery right away. I really wanted to hold my baby, but I knew they would keep him alive. They wheeled him over so I could see him for the first time. He looked right at me. It still makes me tear up when I remember it. He was so calm and just looked me in the eyes. It was a blessing that he did, I needed that so I could know he would be ok. Tyler went with Luke and I told them to send my parents in (who had be waiting in the waiting room for all these many hours). I felt peace and joy. I couldn't stop shivering, but I was so happy they hadn't had to do anything more drastic than an episiotomy! After I was stitched up, cleaned up, and had has some juice and cookies. They wheeled me down to the special care nursery to see my little guy. He was so sweet! 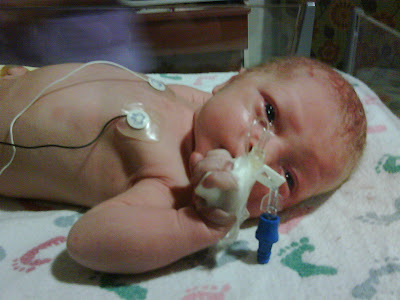 I wanted to just hold him and keep in him my arms but he was hooked up to too many monitors and oxygen and stuff. They told me that he was doing really well and shouldn't need to stay after the required amount of time they would monitor him for. They took us to our new room, which we would stay in for the rest of the time and shortly after we were settled in they brought Luke to us. He was so tired and I tried to nurse him for the first time, but he would just fall asleep. After trying to get him to stay awake and nurse and failing for a while, we gave up and let him sleep. I held him as long as I felt strong enough to and I think Tyler took a turn and then we put him in his basket. They asked if we would like them to clean him off in the nursery and we agreed to let them do that. They took him away and Tyler and I tried to sleep. Let me rephrase that. Tyler fell right to sleep, exhausted as he was. I laid there wishing I could sleep but I had endorphins and adrenaline still running through me and it took a long time before I was able to fall asleep. It seemed like 10 seconds after I finally fell asleep that a nurse came in and informed us that when they'd checked Luke's blood sugar it had been extremely low so they took him back to the special care nursery and a pediatrician would talk to us in the morning. That was a year ago today. The next week was spent at the hospital trying to get Luke to stay awake to nurse to bring his blood sugar up. I'm so glad that everything worked you for you guys. You did a great job! He is such a cute boy. It really is amazing that he is 1 year old.